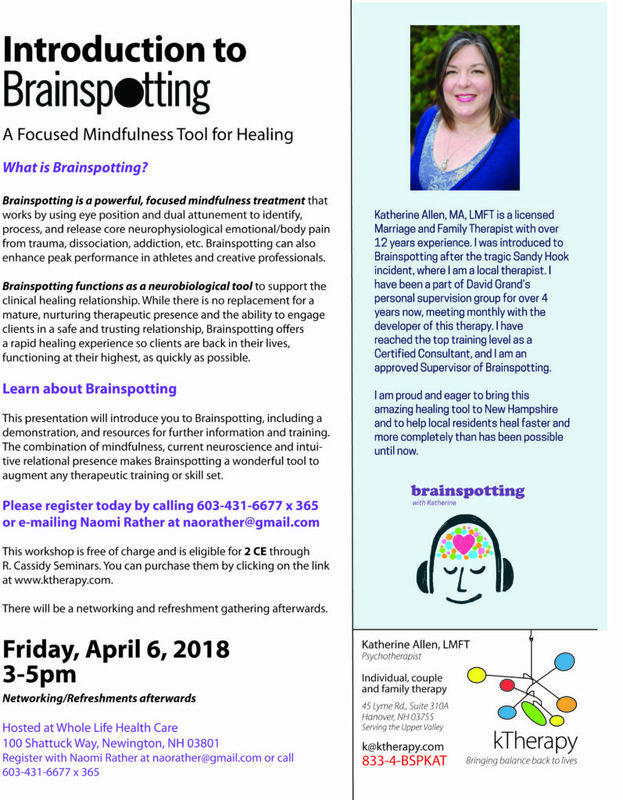 I am pleased to announce that I will be giving a SECOND Introduction to Brainspotting Workshop to the NH Seacoast region. It will be April 6, 2018, from 3-5pm and it will also have a refreshments/networking gathering afterwards. It will be hosted by Naomi Rather at Whole Life Health Care, located at 100 Shattuck Way, Newington, NH 03801. You can register with Naomi directly at naorather@gmail.com or by calling 603-431-6677 x365. There is also be an opportunity to purchase 2 CEs through R. Cassidy Seminars [link]. I am excited to help bring Brainspotting to the Northern New England region. Please don’t hesitate in reaching out to me if another region is interested in a workshop as well.